NOTES : Spayed, HW negative, UTD on vaccines. 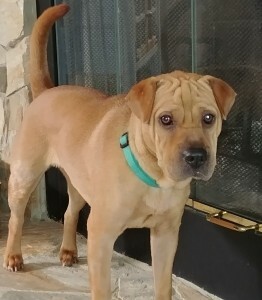 About this Pei: Maggie is a sweet, young girl who was owner surrendered to shelter after having been bought as a puppy from a pet store by same owner. Per owner surrender paperwork, Maggie was surrendered due to aggressive behaviors toward children under the age of 14 years old. Since coming into rescue, Maggie has been in the presence of a 3 year old child, and no aggressive behaviors were noted. Maggie ignored the child after smelling her upon initial meeting. Maggie likes to be close to people, is a snuggler. She does need some training in general manners, though. This girl is a little wild, jumps up on all furniture, puts paws on table/counter when food is in area, has even jumped onto top of dining room table after dinner was cleared away. Manners lessons are already in progress.